Coat of arms of President William Henry Harrison, of the James River Harrisons—the "Yorkshire arms"
Coat of arms of Daniel Harrison, of the Shenandoah Valley Harrisons—the "Durham arms"
The Harrison family of Virginia is a notable political family in the history of the Commonwealth of Virginia and of the United States. Family members include a Founding Father of the nation and three presidents, as well as state governors, legislators, education leaders, and mayors. The family consists of two branches originating in England. Members of one branch emigrated from Bermuda to Virginia before 1633 and settled on the James River, and they are frequently referred to as the James River Harrisons. This branch includes successive generations who served in the legislature of the Colony of Virginia, a signer of the Declaration of Independence, several Virginia governors, and Presidents William Henry Harrison and Benjamin Harrison. The family also produced two Chicago mayors and members of the U. S. House of Representatives. The second branch of the Virginia Harrisons emigrated from Britain to New England in 1687, ultimately settling in the Shenandoah Valley of Virginia 50 years later. This branch is believed to descend from an interim chaplain of the Jamestown Colony who returned to England. The Shenandoah Harrisons include the founder of the city of Harrisonburg, Virginia and President Abraham Lincoln. This branch also includes noted physicians, educators, and local officials. Genealogists speculate that the first Harrisons were Viking warriors of Norse origin, and that they arrived in England with Cnut the Great. Others speculate that they are of Norman, Irish, and Scottish descent. Many Harrisons are known to have settled in Northumberland, as well as Yorkshire and Durham, all in the northernmost region of England. Some continued to use the older spelling "Harryson" ("son of Harry"), although this ended with their arrival in the New World. The two Virginia Harrison lines shared similar coats of arms, both issued in English peerage. They feature helmets and shields emblazoned by gold eagles on a dark field with supporters. 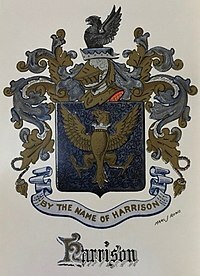 The arms of William Henry Harrison (1773–1841) of the James River Harrisons depict three eagles and are mentioned in the arms of "Harrison of the North", granted in England in 1574, as well as those of "Harrison of London", granted in 1613 with a pedigree dating from 1374. They are often referred to as the "Yorkshire arms". 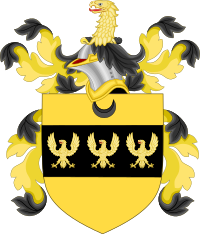 The "Durham arms" were used by Daniel Harrison of the Shenandoah Valley Harrisons, represented by one eagle and sourced to Harrisons descended from Durham. Included is the crest shoulder gules (red) signaling strength or martyrdom. This is established by the pedigree of Robert Harrison in 1630, depicting him as the grandson of Rowland Harrison of Barnard Castle in Durham. The James River Harrisons came to the Colony of Virginia in 1630 when Benjamin Harrison I (1594–1648) left England for America. Several writers state that he had four brothers: Thomas, who also ended up in the south, and Richard, Nathaniel, and Edward who were in the north. Francis Burton Harrison suggested that there was no relationship between Thomas and Benjamin, but he offered no supporting rationale. One source states that Thomas was born in 1616 at Kingston-upon-Hull, Yorkshire, the son of merchant Robert Harrison of Hull. Another source states that Richard Harrison was their father, who descended from Rowland Harrison of Durham. Another tradition indicates that the brothers may have been the sons of Thomas Harrison, Lord of Gobion's Manor (1568–1625), and Elizabeth Bernard (1569–1643) of St. Giles, Nottinghamshire, England. In any case, Benjamin's brother Richard settled in Connecticut Colony while Edward was in Boston. Thomas (1619–1682) arrived in Virginia in 1640 and was the minister at Elizabeth River Parish. He might have been the ancestor of the Shenandoah Harrison family referred to below. The first Benjamin Harrison arrived by 1633 when he was installed as Clerk of the Virginia Governor's Council. In 1642, he became the first of the family to serve as a legislator in the Virginia House of Burgesses. His son Benjamin II (1645–1712) served as County Sheriff and in the House of Burgesses, as well, and also was appointed to the Governor's Council, the upper house of the Colony's legislature. None of the successive Benjamins used the numerical suffix, but it is used today as a convenient tool for distinguishing them. The second Benjamin in turn fathered a Benjamin (1673–1710) who similarly was drafted for public service and power, first as acting attorney general, then Treasurer of the Colony and member, as well as Speaker of the Burgesses. He acquired Berkeley Hundred on the James River. Benjamin Harrison IV (1693–1745) became a member of the House of Burgesses, but he did not otherwise pursue politics. 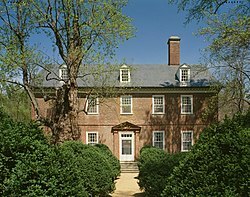 He married Anne Carter (1702–1745), daughter of Robert "King" Carter (1662/63–1732), and built the family homestead Berkeley Plantation. Benjamin Harrison V, "the Signer"
Benjamin Harrison V (1726–1791) is known in the family as "the Signer" of the Declaration of Independence, from his representation of Virginia in the First and Second Continental Congresses. He was chosen Chairman of the Congress' Committee of the Whole, and as such presided over final deliberations of the Declaration. He was a rather corpulent and boisterous man; John Adams referred to him variously as the Congress' "Falstaff", "obscene", "profane", and "impious", although he admitted that "Harrison's contributions and many pleasantries steadied rough sessions." Harrison was a close friend and confidant of George Washington, and he served on the Board of War with Adams, Roger Sherman, James Wilson, and Edward Rutledge, and on the Committee of Secret Correspondence with Benjamin Franklin and John Jay.. 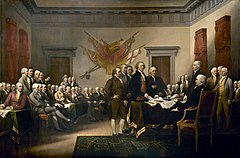 In a poignant anecdote typical for him, Harrison was about to sign the Declaration of Independence, and turned to the diminutive Elbridge Gerry of Massachusetts and said, "I shall have a great advantage over you, Mr. Gerry, when we are all hung for what we are now doing. From the size and weight of my body I shall die in a few minutes and be with the Angels, but from the lightness of your body you will dance in the air an hour or two before you are dead." Harrison's family did experience retaliation from the British for his role in the revolution. Benedict Arnold and his troops pillaged many plantations, including Berkeley in January 1781, and with the intent of eliminating all images of the family, the troops removed every family portrait from Harrison's home and made a bonfire of them. The Harrisons held and traded slaves, although the family sought to teach Christianity to them. They made efforts to keep slave families together, and they abandoned their slaveholding as the abolitionist tradition took hold. Future President Benjamin Harrison began his political career in Indiana by joining the fledgling Republican party then being built on opposition to slavery. He also served in the House of Burgesses and as Governor of Virginia (1781–1784). His brother Nathaniel served as Sheriff of Prince George County and in the House of Delegates, and later settled in Amelia County. Nathaniel's son Edmund served as Speaker in the House. Benjamin Harrison VI (1755–1799) was a successful businessman and also served in the Virginia House of Delegates. 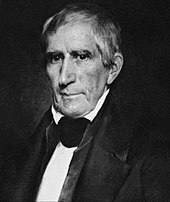 His brother was General William Henry Harrison who served as a congressional delegate for the Northwest Territory, was appointed in 1800 as Governor of the Indiana Territory, and served in the War of 1812. In the 1840 presidential election, William Henry defeated incumbent Martin Van Buren, but fell ill and died just one month into his presidency, and Vice President John Tyler succeeded him. William Henry was the father of Ohio Congressman John Scott Harrison (1804–1878) who was the father of Benjamin Harrison (1833–1901), a brigadier general in the Union Army during the American Civil War. Benjamin also served in the Senate and was elected president in 1888. The James River Harrisons are related by marriage to the Byrds, Lees, Washingtons, Tylers, Randolphs, and Carters. The Harrisons who settled in the Shenandoah Valley in the 1730s came from New England and most likely had common ancestry with the James River family, and they might have descended from Benjamin Harrison I's brother Thomas. He led a parish at Elizabeth River at age 21, and was appointed by Governor William Berkeley as an acting chaplain of the Jamestown Colony. Thomas earned his B.A. from Sydney College, Cambridge in 1638, then sailed to Virginia in 1640. He became a Puritan and left his parishes following the Indian Massacre at Jamestown and moved to Boston where his brother Edward was living. He then married Dorothy Symonds, and repatriated to England. In 1650, he had a parish at St. Dunstan-in-the-East, London, joining the English Puritans. In 1655, then a widow, he became the Chaplain for Henry Cromwell, accompanied him to Ireland, and resided with the Governor and family. Bishop Jeremy Taylor is quoted as saying of Thomas, "...he was rewarded by the governor's confidence, and his advice was often asked for and acted upon. When in 1658 he published his extremely popular manual of piety, Topica Sacra, he was the most popular divine in Ireland." In 1655 Thomas earned his Doctorate of Divinity from Dublin University. In 1659, he married Katherine Bradshaw and resided in Chester, England. He later settled in Dublin and most likely fathered a son named Isaiah in 1666, who was the patriarch of the Virginia Harrisons of the Shenandoah Valley. Thomas died in Dublin in 1682. Gen. Thomas Harrison, regicide of Charles I–his lineage to Virginia is improbable. Some have contended that the Valley Harrisons instead descended from Major General Thomas Harrison (1616–1660), who was not only born in the same year as the reverend, but whose wife was also named Katherine. The general famously participated in the regicide of King Charles I of England, and was in 1660 therefore hanged, drawn and quartered. The reverend's position as a nonconformist likely made them allies as respects the monarchy, which added to the confusion of their identities. No record of a pedigree and succeeding coat of arms for the General's family is found at the Herald's College, as in the case of the reverend. Also, no other lineage to the general has been adequately shown, and it is therefore mostly discredited. The strongest evidence, though circumstantial, is that Rev. Thomas Harrison was the father of Isaiah Harrison (1666–1738), who was born in Dublin at the time of Thomas' residence and marriage there. Thomas' atypical use of the name Isaiah for his son would have been very consistent with his Puritan and nonconformist belief. Thomas' last will and testament of 1671 makes no mention of Isaiah, nor does it include a son Thomas, born in Chester in 1661. Isaiah Harrison is shown at Oyster Bay on Long Island in 1687, the region from which his father Thomas departed on his return to England. The family of Richard Harrison lived across Long Island Sound in New Haven, Connecticut. Richard arrived in Connecticut in 1644 and was Isaiah's uncle. John Harrison is shown in Flushing in 1685, and Samuel at Gloucester in 1688. There are records in Dublin which show Thomas' consistent spelling of Harrison with the double "s", not otherwise found in Ireland or England. Isaiah and his children utilized the same spelling in their American court records. Isaiah's first wife was Elizabeth Wright, with whom he had five children. She died in 1698, and he married Abigail in 1700 produced five children: John (1691–1771), Daniel (1701–1770), Thomas (1704–1785), Samuel (1712–1790), and Abigail (1710–1780). The family lived at Oyster Bay for 14 years, then moved to Smithtown, New York near the Nissequogue River on Long Island, where he remained for 19 years. They moved to Sussex County, Delaware in 1721, where Isaiah acquired the Maiden Plantation and Abigail married Alexander Herring (1708–1780). The Harrison family moved to the Valley of Virginia in 1737 via Alexandria, and camped in the Luray area while waiting for their land grants to be finalized. Isaiah died in 1738 and was buried on the banks of the Shenandoah River. Daniel made the family's first Virginia land acquisition in 1739 in Rockingham County, and he and brother Thomas founded the towns of Dayton and Harrisonburg respectively. Brother John settled at Great Spring, and Samuel settled at nearby Linville. Daniel used the "Durham arms" as his seal for the legal documents in Rockingham. Abigail and her husband Alexander Herring settled at Linville also. Their daughter Bathsheba (1742–1836) married Captain Abraham Lincoln (1744–1786), also of Linville, and they had son Thomas (1778–1851) who married Nancy Hanks (1783–1818). 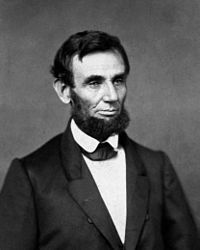 They gave birth to Abraham Lincoln (1809–1865) who became president in 1860. The Shenandoah Valley Harrisons also included a few local officials. Daniel served as a Captain in the French and Indian War and Deputy Sheriff in Augusta County. Thomas was a lieutenant in that conflict. 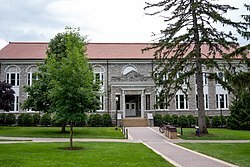 The family also had a number of educators and physicians, primarily from the University of Virginia such as Gessner Harrison, George Tucker, Mary Stuart Smith, and J. Hartwell Harrison. Benjamin IV's Berkeley Plantation in Charles City County, Virginia was the site of one of the first Thanksgivings in 1619 and became the icon of the Harrison family in Virginia. 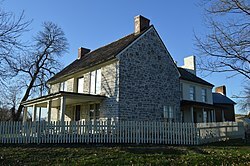 Other historic Virginia homes of the Harrison family include Brandon Plantation, Upper Brandon, Hunting Quarter, The Oaks, The Wigwam, Four Mile Tree, and Kittiewan. The Benjamin Harrison Memorial Bridge is a drawbridge along Virginia State Route 5 and the Virginia Capital Trail across the James River, named in honor of "the Signer". Fort Benjamin Harrison near Indianapolis, Indiana was named for President Benjamin Harrison, who was born in Ohio. The Shenandoah Harrisons also lent their names to Harrison Hall at James Madison University, Daniel Harrison House in Dayton, and other memorials at the University of Virginia. ^ a b c d e f g h i j k Harrison, J. Houston, pp. 67–105. ^ "Benjamin Harrison I". Find A Grave. Retrieved June 25, 2018. ^ a b c Harrison, J. Houston, pp. 10–15. ^ Harrison, J. Houston, pp. 128. ^ Harrison, J. Houston, pp. 280–286. ^ "Ancestry of Abraham Lincoln–Graphic Family Tree". Famous Kin.com. Retrieved April 16, 2018. ^ Harrison, J. Houston, pp. 200, 204. ^ a b Harrison, J. Houston, pp. 89, 191, 319, 396, 478, 555. ^ a b Dowdey, pp. 270–315. Harrison, Francis Burton, "Rev. Thomas Harrison, Berkeley's 'Chaplain'", Virginia Historical Society, Vol. 53, No. 4, Oct. 1945, pp. 302–311. McNamara, Bruce (2008). "Benjamin Harrison". Society of Descendants of Signers of the Declaration of Independence. Retrieved April 11, 2018. Smith, Howard W., "Benjamin Harrison and the American Revolution". Edward M. Riley, editor. Virginia Independence Bicentennial Commission, 1978. This page was last edited on 19 April 2019, at 02:22 (UTC).